“Strategy I think is a scary thing because it can get you in trouble. I think you can have hopes, you can have aspirations, I certainly – I'm a realist, so I understand that, you know, when people say, ‘Is it frustrating that you'll always be known as Jim from 'The Office'?’ I say not at all. In fact, it's a huge compliment. I think that's one of the greatest honors I'll have in my career. That show is everything to me.” – John Krasinski on whether or not he strategizes his career. “The pitch to me was Carlton Cuse, the showrunner, who's incredible and he's done, he was one of the first guys at 'Lost.' He basically said, ‘We're not doing a television series.’ And I thought, yeah, that's a good battle of semantics. And he said, no, the truth is a two hour format for Jack Ryan may not be the best format for the character, because Tom Clancy's books are so detailed and rich. And the character's superpower, if he has one, is his intelligence. So he has to, you know, draw things out and problem-solve. So this 10-part thing – we're going to do a movie and break it into 10 parts every season.” – John Krasinski on his new role as Jack Ryan for Amazon. “To me there was something very different, fresh, and so smart about what he did. He's so incredibly smart, he's so incredibly self-deprecating but he's allowed to be silly. There are very few people who can do what they do and on top of it, as we discussed earlier, he's one of the greatest human beings you'll ever meet. He is so kind and so genuine.” – John Krasinski on his biggest comedic influence, Conan O’Brien. “I married up. That's what you wanted to say, and it's fine.” – John Krasinski on his wife, Emily Blunt. “We really like old-lady names.” – John Krasinski on the names of his two daughters, Hazel and Violet. “I'm actually an independent. I vote – when I grew up I sort of took every issue and every candidate as it comes. I feel like there's something for me that feels like I appreciate the idea of a candidate having to earn my vote.” – John Krasinski on his political party. “All the clichés are true. It's the greatest thing that's ever happened to me. I remember actually Steve Carell before I had kids, before I got married, I asked him and I still think to this day he's described it perfectly. I said, "What's it like before and after kids?" And he said there's no way to combine the two. It's like you have a favorite book that you read over and over and over and over and then one day you put that book down and you started a new book that's your new favorite book and you can't stop reading it. And I thought, that's the perfect way to describe the life before and after kids. 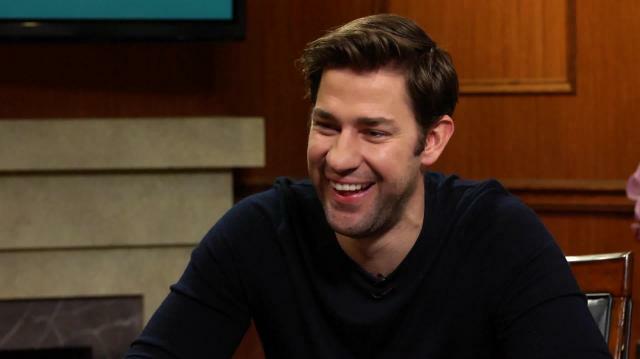 I love it.” – John Krasinski on fatherhood. “The biggest misconception for me at least coming from a place that had no Hollywood connections whatsoever – Boston wasn't a big Hollywood town – was that people are hardened, they're not very good people. That once you get famous you're kind of destined to be a jackass, and that's not true. I've met the most unbelievably dedicated people. I remember Clooney actually said, ‘Hollywood magnifies who you are. If you come in as a good person, you can be a great person. If you come in kind of as a jerk here, you become a different word.’” – John Krasinski on Hollywood misconceptions. “From the second I shook her hand. That's the truth.” – John Krasinski on when he knew his wife, Emily Blunt, was the one.